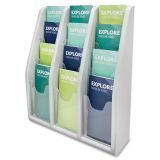 Use individually or in groups to create custom displays. 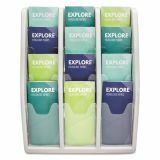 Clear front pockets allow for easy viewing of literature. 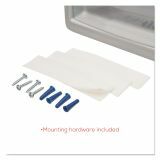 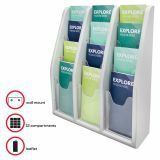 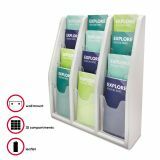 Deflecto Countertop/Wall Mount Literature Display Rack - Versatile, lightweight literature holder easily attaches to walls with strong self-adhesive tape or screws (both included) or simply sits on a countertop. 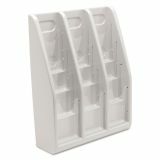 Use alone or group together. 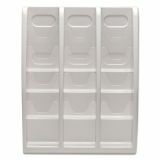 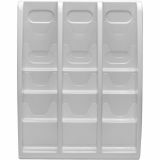 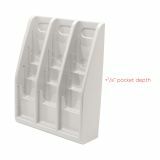 Durable holder features 12 leaflet-size pockets (4-1/4 wide) in three columns and clear dividers to showcase literature. 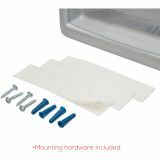 Mounting hardware and two-sided tape pads included.